Markets are one of the great attractions of Istanbul, but the art galleries offer as rich a display of tasty things (well mainly tasty). Istiklal Caddesi’s many contemporary galleries provide a cool respite from the ever-flowing stream of people on the street. 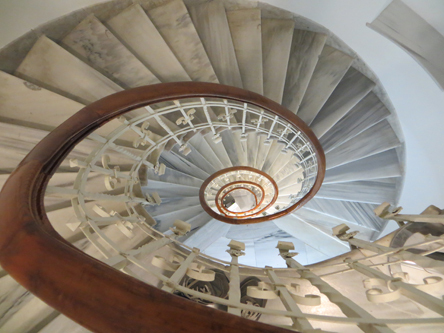 This time we climb the elegant marble staircase to the top floor of Arter to see Sophia Pompéry’s The Silent Shape of Things, the 29-year-old Berlin-born artist’s first solo exhibition in Istanbul. The exhibition is simply enchanting. Mundane objects are interpreted in the multimedia installations to produce soothing lights and sounds. Others pose philosophical questions with a humorous touch: two parallel rulers, supposedly both measuring two metres, are slightly off size.I spend 10 minutes lost in contemplation of the rugged surface of two other small identical things before I realise they are a popcorn cast.